The Apple TV app brings all your shows, movies, sports, and news together in one place. 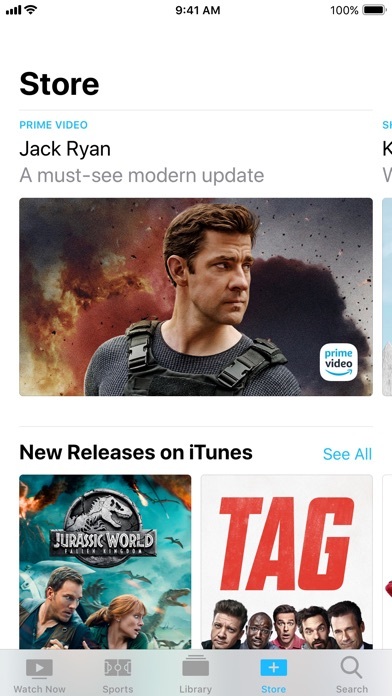 Quickly find and watch your favorites, pick up where you left off, and discover something new across your video apps and the iTunes Store. Watch at home or wherever you go on iPhone, iPad, and Apple TV. Features: • Browse and watch from over 75 video streaming apps such as HBO NOW, Hulu, CBS, Showtime, Starz, ESPN, and Amazon Prime Video. 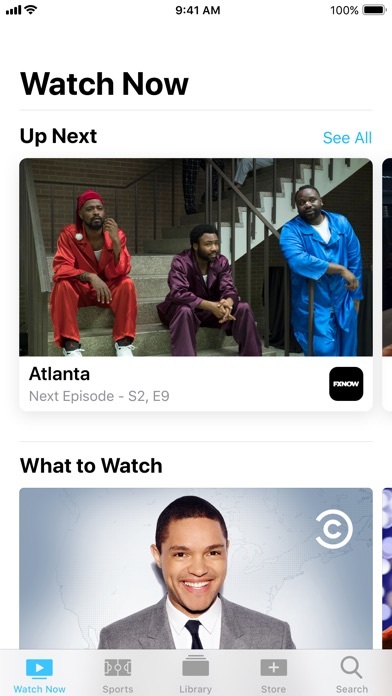 • Sign in to your TV provider to access all supported apps included with your TV subscription • Use Up Next to resume what you’re watching from the moment you left off, across iOS and Apple TV • Use the Search tab to find movies and shows by entering a title or actor. Or ask Siri anytime — no matter what you’re looking for. • Stream your iTunes movies and TV shows over a Wi-Fi or cellular data connection, or download to watch offline. • Never miss the latest episodes of shows you’re watching. 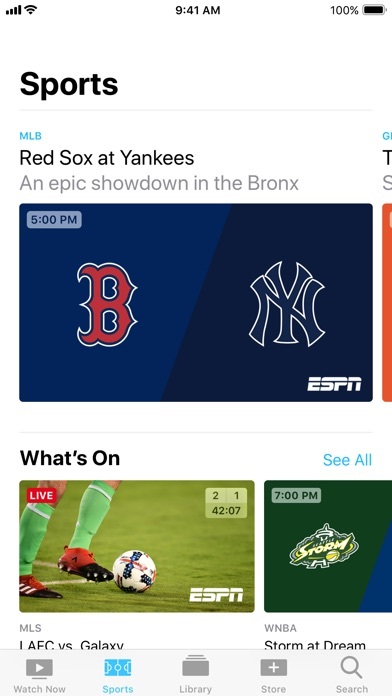 As soon as they’re available you'll get a notification and they’ll appear in Up Next • Browse the Sports tab for live and upcoming games. Choose your favorite teams to automatically add games to Up Next and receive notifications. 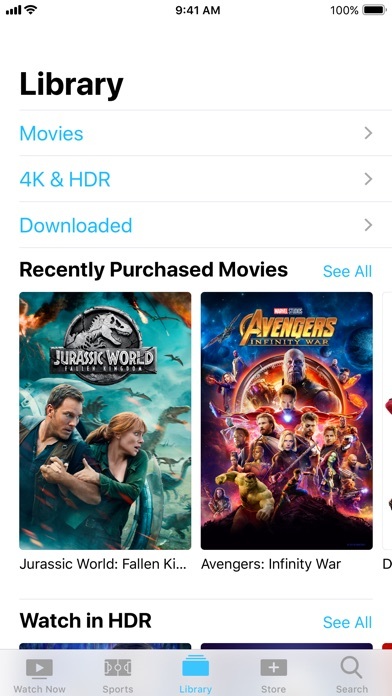 • Everything you’ve purchased from iTunes, along with your current rentals, shows up in your Apple TV App library. • On the Store tab, you can find popular video services and the latest movies and shows on iTunes. • Discover free episodes available to watch now, and find great new shows and movies to stream or buy. • Enjoy select titles in High Dynamic Range (HDR) and experience brighter, more realistic colors and greater detail on iPhone 8 and newer, iPad Pro (2017), and Apple TV 4K.” Requirements: • iOS devices using iOS 10.2 or later. • Some features require internet access over a Wi-Fi or cellular data connection. The Apple TV App allows you to access and watch your favorite TV shows and movies from multiple video apps all in one place across all your supported Apple devices that are signed into the same Apple ID. Apple collects information about what and when you’re watching from connected apps on any of your supported devices. Apple retains this information while you use the app, and for up to one year after you stop using it. To help improve the Apple TV App, Apple may collect and store information about how you use the app for up to 2 years. • HDR video playback may not be available for all content or on all devices.